Currently I have all my original DVDs stuffed away in the basement and ripped to my Mediacenter PC in the living room which keeps me from playing DJ. But I’m still looking for a smaller device for bedroom and at my girlfriend’s. 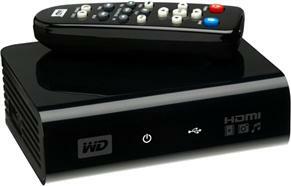 Since Philips does not seem to be interested in fixing bugs but rather releases new hardware I’ve started checking out other products, this time Western Digital’s WD TV. I know, it’s meant to be a HD player and therefore SD material is hardly prioritized, still I don’t get why one of the oldest formats around that any cheapo standalone can playback is not supported. I usually don’t care about menus but having to fast forward through the first three eps of a DVD to watch the last ep is a PITA. Sometimes even this won’t work as VOBs < 30 mins and ISOs < 40 are not recognized (for no technical reason). Apparently I’m not the only one who expected their media center to support old formats as well. Although 4 months for the first firmware update with so few features seemed like a bad joke, a huge community evolved around the WD TV, just check out AVS Forums, english and german Wiki, modded firmware (with nice extra features like network support). WD is doing the right thing by listening to the community and trying to make the WD TV a better product. Way to go. I’ve only corrected the german UI files (ge.po, ge.mo) and adjusted their MD5s, other than that your new wdtv.bin will be identical to the official firmware. It goes without saying that I don’t take any responsibility in case you brick your WD TV. Done properly you can always flash over the original fimware by adding a higher version number to wdtv.ver. I really hope WD is gonna put some more effort into this device and not just it’s already planned successor. Until then I’m gonna return my device and wait for positive rewiews on the next firmware update. This entry was posted in Consumer electronics and tagged b-rad.cc, HD Media Player, HDMI, idx/sub, MKV, no dvd menu support, no ifo support, SRT, USB, WDTV, Western Digital on May 18, 2009 by Marvin.